Drug therapies are often ineffective - they are primarily helpful for early stage intermittent AFib called Paroxysmal AFib. Current EP recording systems can effectively treat arrhythmias like Atrial Flutter and Supra Ventricular Tachycardia which show up as large amplitude, low-frequency signals. We aim to improve the treatments for more complex and prevalent arrhythmias, AFib and VT, which are characterized by low amplitude, high-frequency signals. The signals can be hard to see with current products. As a result, the predominant approach for AFib is 3D anatomical mapping. The doctor will recreate the heart image in 3D and perform ablation on the anatomical location of the pulmonary vein (pulmonary vein isolation), where AFib emanates from. 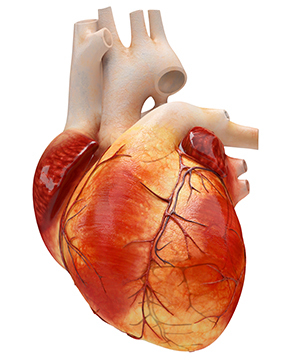 The challenge with 3D mapping of the heart is that the clinicians may not always know if they have made a durable lesion (scar) that was causing the irregular heartbeat. The anatomical map shows you the roads but doesn’t tell you where the potholes are. The procedures are long, 2 to 8 hours, depending on complexity and clinician experience. 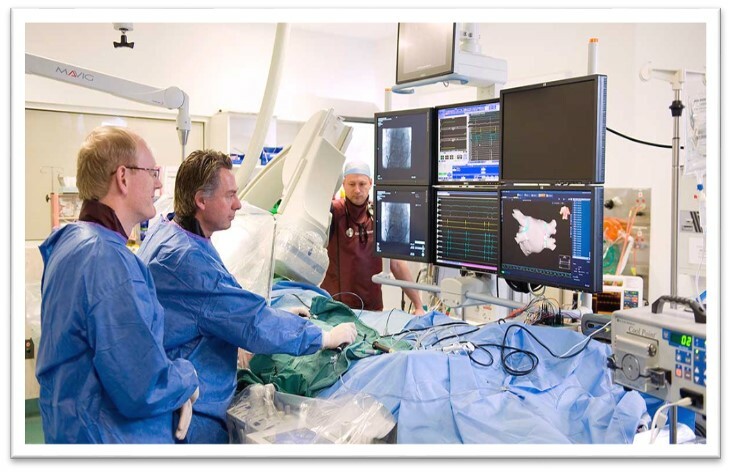 In the picture, you can see a picture of a typical cardiac electrophysiology lab. 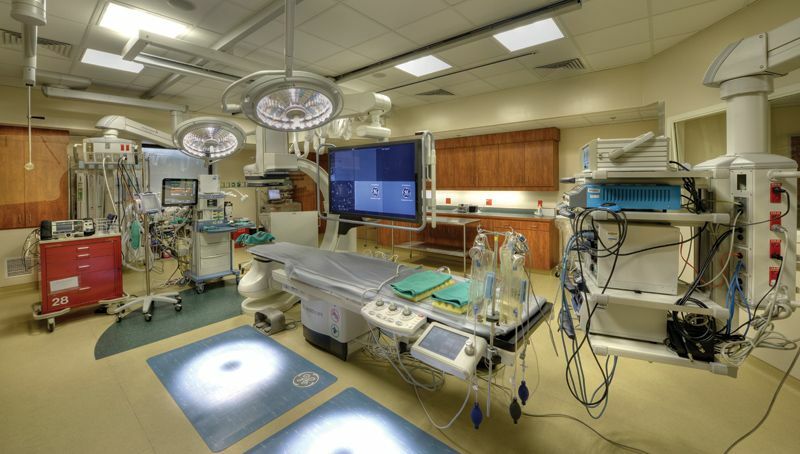 As you can see, there is a lot of electrical equipment here, imaging equipment, monitors, stimulators, and pacing equipment that all generate electrical noise that can make it difficult to clearly see the low amplitude signals the doctor needs to see to work with AFib and VTAC. As a result, many AFib patients have to come back for one or more repeat procedures. These are diagrams of heart rhythms taken from the Pulmonary Vein, which brings blood from the lungs to the heart. This is an important location in determining ablation treatment for Afib, which current systems have difficulty in visualizing. The European Society of Cardiology stated “Additional unnecessary ablation and possibly complications can be avoided” by being able to clearly see signals from the Pulmonary Vein. On the left chart, with existing systems, the important but delicate high-frequency information is being drowned out by the noise which makes the signal looks thick. Rapid up and down curves show high-frequency information. High-frequency information is very valuable because signals close to the electrode position in the heart will have higher frequencies. In our PURE EP System the doctors can apply additional filters to acquire valuable clinical information. In the close-up of the signal in the circle on the right, you can see a short upward spike that is almost lost in the noise on the existing system’s recording. In determining where to ablate, doctors look for exactly these types of small changes on these charts that are often filtered out or get lost in the noise you see on the left side of the chart. This currently results in more treatments and more hospital visits being required until the right areas are found and ablated. The cardiac EP lab environment introduces multiple sources of unwanted radio frequency interference. 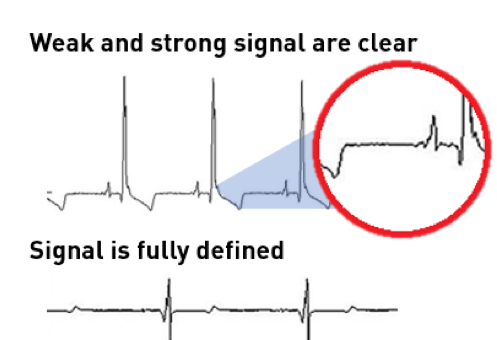 Cardiac signals are small; therefore, require amplification so they can become visible for physicians to interpret. This is achieved by connecting the recording electrodes to an amplifier. Both wanted cardiac and unwanted spurious signals are picked up by the recording electrodes and will be amplified. The main spurious signals which hamper the acquisition process are baseline wander, noise, and artifacts. These need to be removed for successful clinical interpretation. To remove noise and artifacts, recorders currently on the market use low pass, high pass, and notch filters. The problem is that these filters alter the signal and make it difficult or impossible to see the low amplitude, high-frequency signals that help treat AFib and VT.